Georgie is a Cheltenham based artist. She studied Art Foundation there and then attended Loughborough University to study Woven Textiles, graduating in 2010. Georgie has always had a love for colour and pattern. She creates pieces using fine black pen with a mix of promarker pens and watercolour. Her style is unique, and each piece demonstrates painstaking attention to detail through intricate patterns and use of colour. Through her work she aims to evoke the beauty of nature. 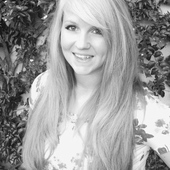 Much of her inspiration has stemmed from India where she undertook a design placement in January 2011 for three months. She hand drew repeat floral and geometric designs for drapery, upholstery and embroidery. Indian influences in the form of vibrant colours and intricate patterns are the inspiration for the style in which she works today.